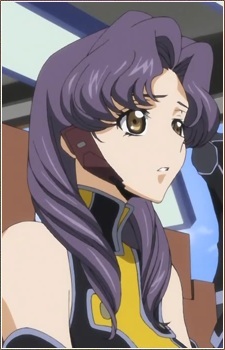 Ayame Futaba is one of the new volunteer members of the Black Knights introduced in the second season. She serves aboard the Ikaruga and appears to run its defensive systems. She wears her hair as a pair of purple mid-length curls. She is seen comforting Tamaki in a hospital after he is defeated by Suzaku in his Lancelot Albion. She refers to him as senpai.